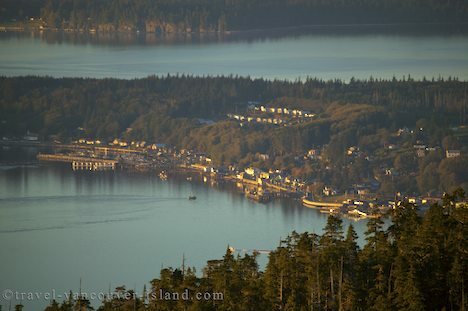 The mellow light of sunset shines on the village of Alert Bay off the coast of Northern Vancouver Island, BC. Village of Alert Bay, First Nations, Cormorant Island, off Northern Vancouver Island, British Columbia, Canada. Photo of the village of Alert Bay on Cormorant Island off Vancouver Island, BC, Canada.